Lincoln Chafee switching parties: It probably won't make much of a difference. 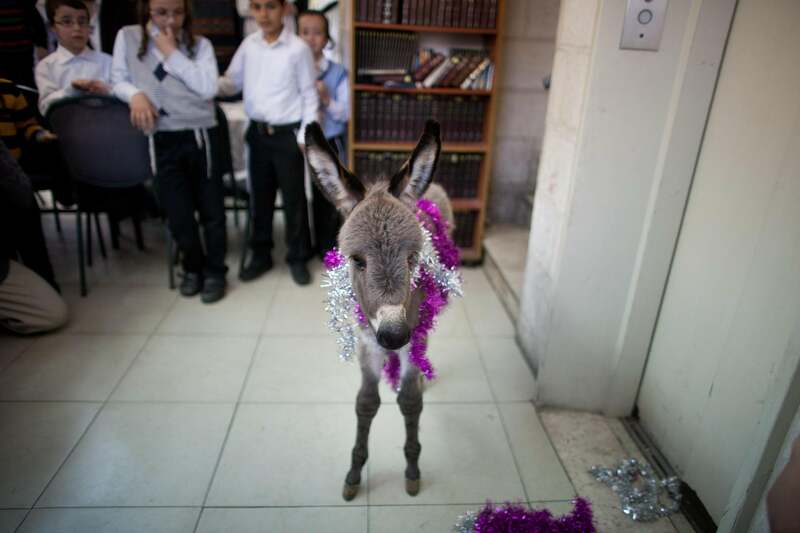 Jewish children gather around a baby donkey as they take part in the ‘Pidyon Peter Chamor’ ceremony, or the ‘Redemption of the first born donkey’ in the Meir Sharim neighborhood on March 28, 2013 in Jerusalem, Israel. Chafee, a former GOP senator elected to the governor’s office as an independent in 2010, has struggled with low approval ratings and faces a difficult reelection fight in 2014. This shouldn’t be much of a surprise, given that Chafee was the sole Republican senator to vote against the Iraq War. But one thing to keep in mind through the inevitable Arlen Specter comparisons is that state executives can exercise a lot more independence in party affiliation than lawmakers, as their image isn’t as closely tied to a voting bloc’s. In other countries, though, it is not uncommon for dozens of legislators to switch parties during a single legislative session. For example, 39% of legislators in Brazil (1991-1994), 33.7% in Italy (1992-1994), 12% in Spain (1986-1989), and 16% in the European Parliament (1989-1994) switched parties (Heller & Mershon 2008, 912). To some extent, these percentages actually understate the frequency of party switching because many of these legislators switched parties more than once. Indeed, the switching rate in Brazil between 1991 and 1994 was 52% once this is taken into account (Desposato 2006, 69). Conversely, there’s a strong taboo against party switching in the UK even though the ideological rift between parties is generally narrower because voting in lockstep is the encouraged norm. In the U.S., there’s a wider ideological divide but also more encouragement for lawmakers to go rogue. Chafee’s calculus isn’t too hard to suss out—his ideology already basically aligns with the party, the party aligns with his constituency, and he wants to tap state party resources. But he’ll have two other Democratic challengers to contend with now, so the only thing this news may change is that he’ll get booted out in the primary instead of the general.